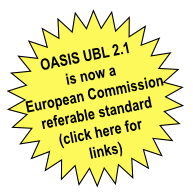 The OASIS Universal Business Language (UBL) provides a royalty-free library of standard electronic XML business documents. With the release of UBL version 2.1 and its submission for ISO standardisation UBL has now gained significant adoption. To build on this foundation UBL International has organised a series of events in Stockholm, Sweden on December 2nd, 3rd and 4th 2014 at the Saturnus Konferens Slussen. These events aim to demonstrating how UBL can facilitate more effective information exchanges across a range of different supply chain processes. Previous events were in 2008 in Rome, Italy, 2007 in Madrid, Spain and the inaugural event 2006 in Copenhagen, Denmark, all of which were tremendous successes. Wednesday, December 3 and Thursday, 4: two separately-subscribed hands-on training classes on OASIS UBL and OASIS Code Lists (used with UBL) delivered by Crane Softwrights Ltd. Please fill out the Registration Form to register for the free symposium and to indicate your interest in attending the commercial training sessions. We recommend to register early as places are limited and are offered on a "first come, first served" basis. There are opportunities for additional sponsorship, Please contact Crane Softwrights Ltd. as soon as possible. We are also looking for lesser sponsorships for conference incidentals (Internet access, conference bags, handout reproduction, etc.). Conference co-organizers are Softarc (Sweden), Document Engineering Services (Australia) and Crane Softwrights Ltd. (Canada). Supported by OASIS.